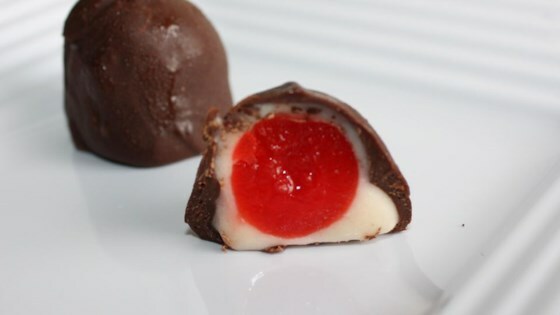 "Easy, delicious cherries. Just like you buy in the box! It's best to let the candies ripen for 1 to 2 weeks." Drain cherries and set on paper towels to dry. In a medium bowl, combine butter and corn syrup until smooth. Stir in confectioners' sugar and knead to form a dough. Chill to stiffen if necessary. Wrap each cherry in about 1 teaspoon of dough. Chill until firm. Melt confectioners' coating in a heavy saucepan over low heat. Dip each cherry in by its stem, and place on waxed paper lined sheets. Chill until completely set. Store in an airtight container in a cool place. Best after 1 or 2 weeks. Crispy, salty potato chips dunked in chocolate. Who’d even try to eat just one?